Maxi-Health Research® has joined Wakunaga of America Inc®, the producers of natural high quality, odorless garlic and created Maxi Biotic. We combine high potency pure Kyolic odorless garlic with Echinacea extract, Oregano extract, and Earthrise® spirulina. Garlic is among the few herbs that are universally used and recognized for its beneficial effects. Its daily use aids and supports the body in ways that no other herb does. The volatile oil found in garlic is an effective agent and is largely excreted via the lungs. The exclusive aging process used eliminates garlic odor and harsh side effects. Moreover, it contains various antioxidant properties. Kyolic whole clove garlic is grown in specially prepared, organically rich, and uncontaminated soil. Furthermore, no pesticides are used in growing Kyolic Garlic. Kyolic is the first garlic supplement to offer standardized levels of SAC (S-Allyl Cysteine). SAC represents many important, valuable, stable and safe principles of garlic. Oregano is a plant originally cultivated in the Mediterranean regions. The herb is rich in poly-phenolic flavonoid anti-oxidants (vitamin A, carotenes, lutein, zea-xanthin, and cryptoxanthin) and has been rated as one of the plant sources with highest anti-oxidant activities. These compounds help act as protective scavengers against oxygen-derived free radicals and reactive oxygen species (ROS). Earthrise® Spirulina, the highest quality, purest spirulina available. Spirulina is blue green algae that are extremely rich in protein (65%). It is also an excellent source of essential amino acids and is an important trace material. For all the things that you depend on echinacea for this formula has even more. Try Maxi Biotic from Maxi-Health Research®, your premier dietary supplement company. Long Term Use: Two capsules twice daily. Short Term Use: Three capsules every four hours. For Children: One half adult dose. Other Ingredients: Cellulose, silica, maltodextrin, and magnesium stearate. Enzymax® (a vital digestive enzyme complex) is a registered trademark of Maxi Health Research®, LLC. Kyolic® and Aged Garlic Extract™ are trademarks of Wakunaga of America Co., Ltd. Here is a real story that can help others too. One day I woke up and I felt terrible! With a sore throat, I was almost sure I had a strep throat. But, I decided to try healing myself naturally. I took 3 Maxi Health Biotic capsules 4 times a day (every four hours) and vitamin C. After two days I felt much better (Baruch Hashem). The third day I forgot already to take it because I almost didn't feel any pain. It's really amazing!! I use Maxi Biotic 450 when I feel like I am coming down with a cold for flu. After just a few doses I feel like I am back to normal. It works like an antibiotic! Thank you so much. Dear Maxi Health. I had many sinus infections, which ended up with temperature and antibiotics. Then I found out about Maxi Biotic. The next time it reoccurred I didn't wait, instead I took Maxi Biotic for a few days. It got better right away and disappeared. Thanks for such a miraculous vitamin! 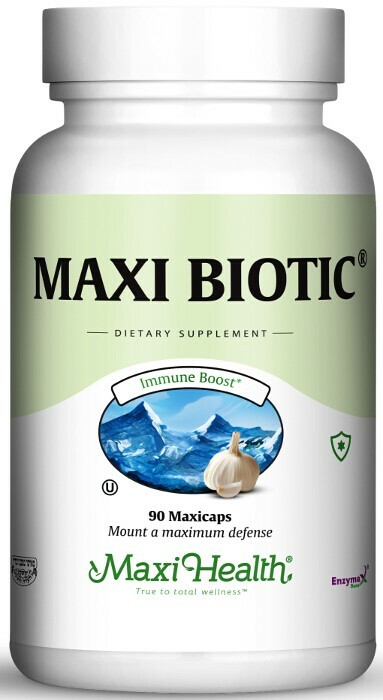 I use Maxi Biotic-450 when I feel like I am coming down with a cold or flu. After just a few doses I feel like I am back to normal. It works like an antibiotic. Thank you so much. We are very greatful for Maxi Biotic 450. It helps the entire family if we catch colds or feel run-down. We are happy not to have to take anti-biotics. I take Maxi Biotic regularly and despite weather changes, did not experience a cold yet. I have been using Maxi Biotic almost daily for a few years. I used to get colds very often. Since I use Maxi Biotic I am thankfully cold free. It's a great product and I let my family and afriends know how beneficial it is. Thank you! A few weeks ago I was lying in bed with the flu. I had been taking Motrin and Tylenol but didn't feel any better. I only felt much better after taking Maxi Biotic. My children and I used to suffer from colds all throughout the winter. Since I discoverer Maxi Biotic, I have seen tremendous results. As soon as I feel the first symptoms of a cold, I take it and the cold disappears. Thank you so much for your wonderful products!